What do Albany, NY, Dallas, TX, Burlington, VT, and Boise, ID all have in common? Craft Beer? Bears? Nope (well, maybe): Each is a designated Refugee Resettlement City. The Office of Refugee Resettlement (ORR) is a result of The Refugee Act of 1980, a piece of legislation that sought to standardize resettlement programs for all refugees admitted to the United States. Though certain states have specialized services for refugees, in each county, and possibly each classroom in the United States, there are refugees, children of refugees, grandchildren of refugees, and great-grandchildren of refugees. This past year, “refugee resettlement” has become an explosive topic, too often one colored by xenophobia and fear. While many Americans trace their lineage back to their ancestors’ home countries – countries frequently fled due to famine and violence – Nationalism seems to trump empathy in the current discussion of refugees. The United States is traditionally thought of as a melting pot, a country for the homeless, but our borders are tightening. Those borders are not only at Customs control but also in our minds. 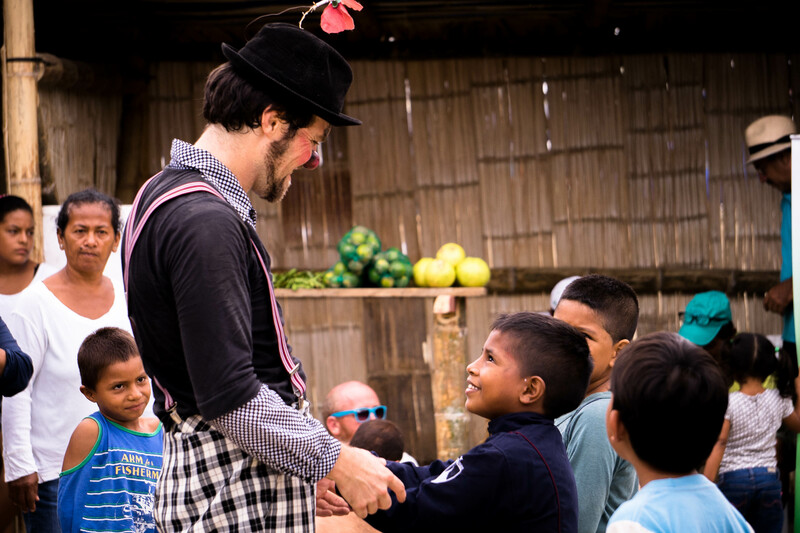 Clowns Without Borders is launching a domestic education program, called “Take Laughter With You.” The message is simple: Wherever you go, Take Laughter With You. We cannot fly to Turkey or South Sudan. We lack the security clearance to return to the Moria camp in Lesvos. We can make a change at home. We can work with children in the United States, just like we work with children in refugee camps, to build community and start cross-cultural conversations. We see young people as powerful change agents. On our international projects, it is often children who approach artists first. It is the children who initiate play and transform the refugee camps, replacing isolation with collaboration. We believe the same can be true in the United States. We do not need airplane tickets to inspire resilience in laughter. We only need schools, youth groups, and communities to invite us in. We are prototyping this project in real time, refining as we go. We are already building relationships with educators and community leaders. We want our program to be agile, relevant, and immediate. That means, when you invite us, we will come! Are you an educator or a parent who wants to be involved as a consultant? Are you an educator or a parent who wants to invite us to your school or club? Do you have ideas about how to teach children empathy for refugees? Now is the time for positive change. Now is the time to protect all children’s futures. Will you join us? 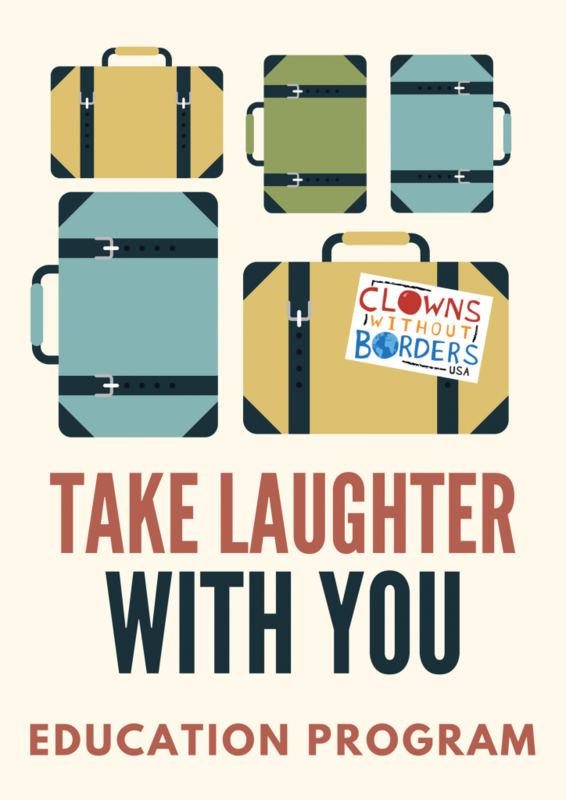 Visit our Resources page to get a glimpse of the “Take Laughter With You” prototype. Hi! Clowns without borders! I have this six months just to do some voluntereen work and to TRAVEL! Could you advice me some org. That could be interested in having me as a volunteer?? I am a physical education teacher, i am dancer, médico de la risa, and softball player! I will be in September in Cambodia doing two weeks of english clases in a Orphan and i will be hanging out there (Asia) until january! HI, I am interested in being a clown volunteer. I have been to over 25 different countries and territories. I love to travel and have people laugh. My back ground was a preschool teacher retired now, strong, highly motivated, love all cultures and have worked or volunteered in all kinds of countries and all type of people from birth to death as I volunteered in a nursing home, assisted living environment with a Montessori background. I have worked with puppets, STORYTELLING, and various art activities. Funding should be no problems as well as the traveling I have taught English as a second language with refugees from several countries. I have lived in Asia and the Pacific areas. I have been volunteering since I was nine. I can be reached best via email. Thanks so much for your interest in our work. The best way to apply to be part of the team is with this link. Our volunteers are all professional performing artists, and CWB-USA covers all costs for the tour.